Male 4 ft. 10 in. +2d12 in. Female 4 ft. 5 in. +2d12 in. As seen by civilized races, half-orcs are monstrosities, the result of perversion and violence—whether or not this is actually true. Half-orcs are rarely the result of loving unions, and as such are usually forced to grow up hard and fast, constantly fighting for protection or to make names for themselves. Half-orcs as a whole resent this treatment, and rather than play the part of the victim, they tend to lash out, unknowingly confirming the biases of those around them. A few feared, distrusted, and spat-upon half-orcs manage to surprise their detractors with great deeds and unexpected wisdom—though sometimes it's easier just to crack a few skulls. Some half-orcs spend their entire lives proving to full-blooded orcs that they are just as fierce. Others opt for trying to blend into human society, constantly demonstrating that they aren't monsters. Their need to always prove themselves worthy encourages half-orcs to strive for power and greatness within the society around them. Physical Description: Half-orcs average around 6 feet tall, with powerful builds and greenish or grayish skin. Their canine teeth often grow long enough to protrude from their mouths, and these “tusks,” combined with heavy brows and slightly pointed ears, give them their notoriously bestial appearance. While half-orcs may be impressive, few ever describe them as beautiful. Despite these obvious orc traits, half-orcs are as varied as their human parents. Society: Unlike half-elves, where at least part of society's discrimination is born out of jealousy or attraction, half-orcs get the worst of both worlds: physically weaker than their orc kin, they also tend to be feared or attacked outright by humans who don't bother making the distinction between full orcs and half bloods. Even on the best of terms, half-orcs in civilized societies are not exactly accepted, and tend to be valued only for their physical abilities. On the other hand, orc leaders have been known to deliberately spawn half-orcs, as the half breeds make up for their lack of physical strength with increased cunning and aggression, making them natural leaders and strategic advisors. Within orc tribes, half-orcs find themselves constantly striving to prove their worth in battle and with feats of strength. Half-orcs raised within orc tribes are more likely to file their tusks and cover themselves in tribal tattoos. Tribal leaders quietly recognize that half-orcs are often more clever than their orc cousins and often apprentice them to the tribe's shaman, where their cunning might eventually strengthen the tribe. Apprenticeship to a shaman is a brutal and often short-lived distinction, however, and those half-orcs who survive it either become influential in the tribe or are eventually driven to leave. Half-orcs have a much more mixed experience in human society, where many cultures view them as little more than monsters. They often are unable even to get normal work, and are pressed into service in the military or sold into slavery. In these cultures, half-orcs often lead furtive lives, hiding their nature whenever possible. The dark underworld of society is often the most welcoming place, and many half-orcs wind up serving as enforcers for thieves guilds or other types of organized crime. Less commonly, human cities may allow half-orcs a more normal existence, even enabling them to develop small communities of their own. These communities are usually centered around the arena districts, the military, or mercenary organizations where their brute strength is valued and their appearance is more likely to be overlooked. Even surrounded by their own kind, half-orc life isn't easy. Bullying and physical confrontation comes easy to a people who have been raised with few other examples of behavior. It is, however, one of the best places for young half-orcs to grow up without prejudice, and these small enclaves are one of the few places where half-orc marriages and children are truly accepted and sometimes cherished. Even more rarely, certain human cultures come to embrace half-orcs for their strength. There are stories of places where people see half-orc children as a blessing and seek out half-orc or orc lovers. In these cultures, half-orcs lead lives not much different from full-blooded humans. Relations: Elves and dwarves tend to be the least accepting of half-orcs, seeing in them too great a resemblance to their racial enemies, and other races aren't much more understanding. A lifetime of persecution leaves the average half-orc wary and quick to anger, yet people who break through his savage exterior might find a well-hidden core of empathy. Human societies with few orc problems tend to be the most accommodating, and half-orcs dwelling there can often find work as mercenaries and enforcers. Even in places where there is a general tolerance for half-orcs, however, many humans mistreat them when they can get away with it. Half-orcs are envious of the measure of acceptance half-elves have within human and elven society and resent their physical beauty, which contrasts starkly to the half-orcs' brutish appearance. While half-orcs avoid antagonizing their half-breed cousins directly, they won't hesitate to undermine them if the opportunity presents itself. Of all the other races, half-orcs are most sympathetic with halflings, who often have an equally rough lot in life. Half-orcs respect the halfling's ability to blend in and disappear and admire their perpetually cheerful outlook on life in spite of hardships. Halflings fail to appreciate this fact because they usually are too busy avoiding the large, intimidating half-orcs. Alignment and Religion: Forced to live either among brutish orcs or as lonely outcasts in civilized lands, most half-orcs are bitter, violent, and reclusive. Evil comes easily to them, but they are not evil by nature—rather, most half-orcs are chaotic neutral, having been taught by long experience that there's no point doing anything but that which directly benefits themselves. Half-orcs worship the human or orc gods venerated in the area where they were raised. Those who live alongside humans most often worship human gods of war, freedom, or destruction. Half-orcs raised in orc tribes find themselves most drawn to the gods of blood, fire, and iron—depending more on what god the tribe worships rather than the half-orcs' personal preference. Many half-orcs are contrary about religion, either ignoring it entirely, or getting deeply involved in it and trying to find meaning in a life filled with hate and misunderstanding; even a half-orc divine spellcaster may wrestle with doubt and anger about religion and faith. Adventurers: Staunchly independent, many half-orcs take to lives of adventure out of necessity, seeking to escape their painful pasts or improve their lot through force of arms. Others, more optimistic or desperate for acceptance, take up the mantle of crusaders in order to prove their worth to the world. Half-orcs raised in orc societies often take up the brutish ways of those around them, becoming fighters, barbarians, or rangers. Half-orcs who survive their shaman training may eventually succeed their masters as tribal shamans, or flee the tribe and practice their magic as outcasts or explorers. Half-orcs are just as likely to have children that possess an innate talent for sorcery as any other race, with the abyssal, destined, and elemental (fire) bloodlines being the most common types of sorcerers. Half-orcs are fascinated by alchemy, and its destructive capabilities make its usefulness obvious in any orc tribe. Half-orc alchemists treat themselves as living experiments, even to the point of trying to separate their orc and human halves through alchemy. Other alchemists use their powers to enhance their physical abilities and thus increase their status within orc communities. In human societies, half-orcs have a few more options. Many find it easy to take advantage of the brute strength and work as mercenaries or caravan guards. Crime is another easy route for half-orcs, as there are plenty of criminals looking for a strong arm. Half-orc clerics in human communities are fairly rare; the more religious half-orcs more often turn to (or get pushed to) the martial aspects of religious service and become paladins or inquisitors. Half-orcs usually lack the patience and money required to become a wizard. Males names: Ausk, Davor, Hakak, Kizziar, Makoa, Nesteruk, Tsadok. Ability Score Racial Traits: Half-orc characters gain a +2 bonus to one ability score of their choice at creation to represent their varied nature. Beastmaster: Some half-orcs have a spiritual kinship with fantastical beasts, capturing them for sport or living and hunting with them. A half-orc with this trait treats whips and nets as martial weapons and gains a +2 racial bonus on Handle Animal checks. This racial trait replaces orc ferocity. Bestial: The orc blood of some half-orcs manifests in the form of particularly prominent orc features, exacerbating their bestial appearances but improving their already keen senses. They gain a +2 racial bonus on Perception checks. This racial trait replaces orc ferocity. Cavewight: Some half-orcs live far below the surface, seeking freedom in winding cave complexes. Half-orcs with this racial trait gain a +1 racial bonus on Knowledge (dungeoneering) and Survival checks made underground. This racial trait replaces the intimidating racial trait. Chain Fighter: Some half-orcs have escaped from slavery and reforged the chains of their imprisonment into deadly weapons. Half-orcs with this racial trait are proficient with flails and heavy flails, and treat dire flails and spiked chains as martial weapons. This racial trait replaces weapon familiarity. City-Raised: Half-orcs with this trait know little of their orc ancestry and were raised among humans and other half-orcs in a large city. City-raised half-orcs are proficient with whips and longswords, and receive a +2 racial bonus on Knowledge (local) checks. This racial trait replaces weapon familiarity. Forest Walker: More at home in the forests and jungles of the world, these half-orcs are well adapted to their surroundings. Half-orcs with this trait have low-light vision and gain a +2 racial bonus on Climb checks. This racial trait replaces darkvision. Gatecrasher: Many half-orcs revel in acts of wanton destruction. Half-orcs with this racial trait gain a +2 racial bonus on Strength checks to break objects and on sunder combat maneuver checks. This racial trait replaces orc ferocity. Rock Climber: Half-orcs from mountainous regions are excellent climbers, and sometimes ambush prey by leaping down from above. Half-orcs with this racial trait gain a +1 racial bonus on Acrobatics and Climb checks. This racial trait replaces the intimidating trait. Sacred Tattoo: Many half-orcs decorate themselves with tattoos, piercings, and ritual scarification, which they consider sacred markings. Half-orcs with this racial trait gain a +1 luck bonus on all saving throws. This racial trait replaces orc ferocity. Scavenger: Some half-orcs eke out a leaving picking over the garbage heaps of society, and must learn to separate rare finds from the inevitable dross. Half-orcs with this racial trait receive a +2 racial bonus on Appraise checks and on Perception checks to find hidden objects (including traps and secret doors), determine whether food is spoiled, or identify a potion by taste. This racial trait replaces the intimidating trait. Shaman's Apprentice: Only the most stalwart survive the years of harsh treatment that an apprenticeship to an orc shaman entails. Half-orcs with this trait gain Endurance as a bonus feat. This racial trait replaces the intimidating trait. Skilled: Second- and third-generation half-orcs often favor their human heritage more than their orc heritage. Half-orcs with this trait gain 1 additional skill rank per level. This racial trait replaces darkvision. Squalid: Some half-orcs exist in surroundings so filthy and pestilent that even orcs would have difficulty living in them. Half-orcs with this racial trait gain a +2 racial bonus on saving throws made to resist nausea, the sickened condition, and disease. This racial trait replaces orc ferocity. Toothy: Some half-orcs' tusks are large and sharp, granting a bite attack. This is a primary natural attack that deals 1d4 points of piercing damage. This racial trait replaces orc ferocity. Arena-Bred: Many half-orcs are born and raised to fight in the arena, and in many cases have two half-orc parents or even a half-orc and a human parent. These arena-bred half-orcs lose the brutal physical appearance of their orc ancestors and look more human. They have the city-raised and skilled alternate racial traits. Deep Kin: Some half-orcs are descended from clans that remained in the eternal darkness below the surface. Half-orcs from these clans tend to be smaller and more at home underground than those descended from surface-dwelling orcs. These half-orcs have the acute darkvision and cavewight alternate racial traits. Feral: Half-orc children who are abandoned as infants or small children rarely survive in the wild, but a few manage to scrape out a meager existence as “wild children,” tough enough to live but completely uncivilized. Feral half-orcs have the forest walker and toothy alternate racial traits. Mountain Clan: Half-orcs from the more mountainous regions tend to be more agile and alert to the echoing sounds of their homeland. Mountain clan half-orcs have the bestial and rock climber racial traits. Mystic: Orc shamans are brutal teachers who sometimes kill or maim their most promising students in order to eliminate what could be a potential rival. Half-orcs who survive years of abuse by an orc shaman master are deeply scarred and altered by the experience. Shaman trainees learn early that cunning and luck are often the only things that offer a chance of survival. They have the shaman's apprentice and sacred tattoo alternate racial traits. Can a half-orc select human racial favored class options? Arcanist: Gain a +1 bonus on concentration checks made due to taking damage while casting arcanist spells. Hunter: Add 1 hit point to the hunter's animal companion. If the hunter replaces his animal companion, the new animal companion gains these bonus hit points. Druid: Add +1/3 to the druid's natural armor bonus when using wild shape. Fighter: Add a +2 bonus on rolls to stabilize when dying. Gunslinger: Add a +1/3 bonus on attack rolls when using the pistol whip deed. Inquisitor: Add a +1/2 bonus on Intimidate checks and Knowledge checks to identify creatures. Investigator: Gain a +1/3 bonus on critical hit confirmation rolls made while using studied combat (maximum bonus of +5). This bonus does not stack with those gained through Critical Focus and similar effects. Magus: Add +1/2 point of fire damage to spells that deal fire damage cast by the magus. Monk: Add +1 to the monk's CMD when resisting a grapple and +1/2 to the number of stunning attacks he can attempt per day. Paladin: Add +1/3 on critical hit confirmation rolls made while using smite evil (maximum bonus of +5). This bonus does not stack with Critical Focus. Ranger: Add +1 hit point to the ranger's animal companion. If the ranger ever replaces his animal companion, the new animal companion gains these bonus hit points. Slayer: Gain a +1/3 bonus on critical hit confirmation rolls made while using sneak attack (maximum bonus of +5). This bonus doesn't stack with those gained through Critical Focus and similar effects. Sorcerer: Add +1/2 point of fire damage to spells that deal fire damage cast by the sorcerer. Swashbuckler: Gain a +1/3 bonus on all critical hit confirmation rolls made while using the precise strike deed (maximum bonus of +5). This bonus doesn't stack with those gained through Critical Focus and similar effects. Witch: Add +1 skill rank to the witch's familiar. If the half-orc ever replaces her familiar, the new familiar gains these bonus skill ranks. Wizard: Add a +1 bonus on concentration checks made due to taking damage while casting wizard spells. 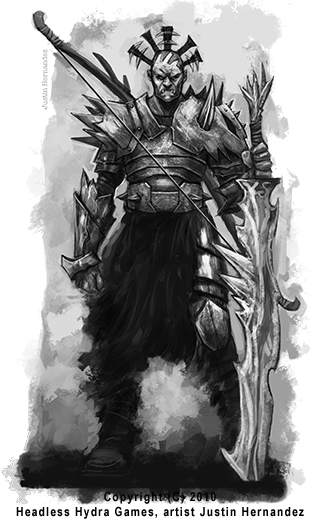 The following feats are available to a half-orc character who meets the prerequisites.